The industry benchmark for random orbital polishing and waxing just got better! Some things just get better with age! The 3rd generation Griots Garage 6 Inch Random Orbital Polisher improves the user experience by combining the same industry leading power of the previous model with a focus on improving user comfort. The 3rd generation Griots Garage 6 Inch Random Orbital Polisher is engineered with the same powerful 7-amp, 850-watt motor that eliminates paint defects with ease. Water spots, oxidation, swirl marks, and scratches are no match for this powerful tool. 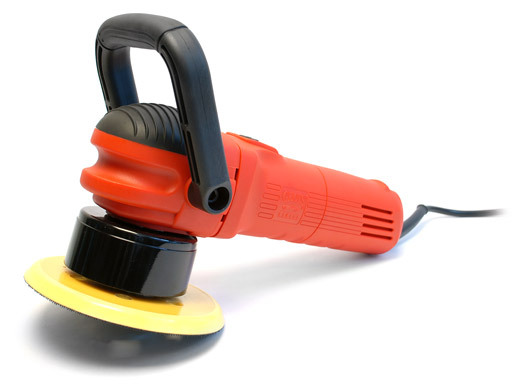 Because the Griot’s Garage 6 Inch Orbital Polisher features the same paint-safe dual action polishing motion, the risk of damaging or overheating the paint is greatly reduced. You can achieve professional polishing results without damaging your paint with the 3rd generation Griot’s Garage 6 Inch Random Orbital Polisher. The 3rd Generation Griots Garage 6 inch Random Orbital Polisher improves user comfort with carefully designed ergonomics that allow you to get the most from the class leading power. This dual action random orbital polisher features a strong 5/16’ stroke and six variable speeds, from 2800 to 6800 OPMs (oscillations per minute). Any standard DA backing plate will fit so you can use your favorite polishing pad selections and sizes. With the 3rd generation Griots Garage 6 inch Random Orbital Polisher your results will benefit with increased comfort and the with better control. 6 inch hook and loop backing plate included. Meguiars Mirror Glaze 105 Ultra-Cut Compound 8 oz. Meguiars Mirror Glaze 205 Ultra Finishing Polish 8 oz. Makes Car Care So Much Easier! I bought a new C7 Corvette and want to keep her beautiful all the time. I read up on orbital polishers online and found that for the money the Griots looked like one of the best. I was not disappointed! This polisher is so well balanced and works like a dream. It runs smooth and cool and applies the polishes and removes them with ease. Never again will I hand wax/polish another car. Get this polisher and you will not be disappointed. Watch a few videos then use as instructed. Works great. First time I used a machine polisher. Outstanding value versus price of other polishers. ConsHeavy but probably needs to be. If you don't want to break the bank this is it. It's way above a PC in power and any other polisher in it's class. Griot's did it right. With a random orbital you need power to combat pad stall and that's what they put in it. With all the other polisher in it's class running around 500-550 watts. This surpasses them all. Let's be honest it's not an animal like a Flex or as fast as Rupes but it's hard to make it stall. You can make any Rupes stall. In my opinion unless you want to step up to a Flex or a BOSS then this is your polisher. It's smoother then a PC and more comfortable and I actually like the Bale handle. You also can just swap out BP's if you want to go with smaller pads. You can't do that with a large throw machine. If you want a do it all machine and are willing to spend some extra time working on the paint then this is the perfect middle of the road polisher. One machine, lots of options and a lifetime warranty. ConsMore time for same results as a large throw or forced rotation. Still have to deal with the vibration but not as bad as a PC Wish they would have out thought PC and other brands and move the speed dial up by the power switch. All I had to do was to watch some YouTube videos and follow those instructions to polish my car. 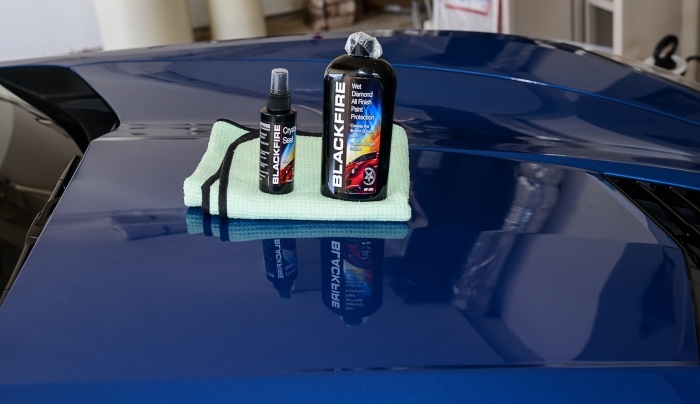 Used BlackFire Total Polish and Seal and Crystal Seal. The result was fantastic. I read a lot of reviews of this and the Porter Cable one. The Porter Cable one's little cheaper, but I chose this because of their unbeatable warranty, life-time. ConsIt would've been better if it came with a 5-inch backing plate. Get this instead of the Porter Cable, or the Harbor Freight one!!! This is my first polisher and I was very concerned I might damage my paint. Everyone recommended this polisher and said it would be impossible to damage the car unless I tried to. They were right. I detailed my car this weekend and had no problems and the results were incredible. My paint job looks like a mirror and this was very easy to use. Minimal learning curve. ProsEase of use. Safe to use. Easy to handle. This is my first DA polisher purchase. I did an endless amount of research and finally purchased the GG. The unit is fabulous. Great ergonomics, easy to use, powerful. I love that the handle centers my hand over the polisher pad. Seems very well made and has a lifetime warranty. Great purchase. I recently took delivery of my second one of these polishers. My other one is the second generation machine while this one is the third generation. While the internals and functions are identical, the refinements make this a more user friendly polisher. The soft rubber grip on the handle is a nice touch, though I use it without the handle as I find handles in general too bulky and prefer to place my hand directly on the machine right over the pad so I can apply even and direct pressure. This also allows me to have a better feel for what the machine is actually doing. Just my preference. Also the variable speed selector has been moved to the top rear edge from the end where the cord attaches. This makes adjusting the speed on the fly much easier and you know at a glance exactly what speed you're on. The old setup is awkward. It's nice when a company listens to customer feedback and implements that feedback in its product updates. Kudos to Griots Garage for this! This polisher has the most powerful motor in this class of polishers. Through personal experience with this machine, I have found that it works better with a 5" backing plate and 5-1/2" pads. It will bog down and stop rotating with the supplied 6" backing plate and 6-1/2" pads. 6-1/2" pads are also thicker which causes the power of the machine to get absorbed into the pad material, thus making it more likely to bog down and stop rotating. I have no such problems with the lower profile 5-1/2" pads. In fact this machine is a beast with the smaller pads installed on it. It works fantastic with microfiber pads. Out of a week's worth of details, I only reach for my Flex 3401 an average of twice a week and I use my rotary polishers once or twice a month to take out serious scratches, defects or after I've wet sanded something. Other than that, this is my machine of choice for it's versatility and its size. Is it as refined as a Rupes Bigfoot? Absolutely not. But it doesn't cost the $400.00 the Bigfoot 21 does and it has far more power and won't bog down the way the Bigfoot 15 does. And yes, I have those machines too. I don't like the Bigfoot 15 and will be giving it to a family member and I use the Bigfoot 21 when I'm doing large vehicles with large, flat body panels where it's at it's best. I would say that 95% of what I do is accomplished with this machine with 5-1/2" pads, my Flex 3401 (also with the smaller backing plate and 5-1/2" pads) and my Porter Cable 7424XP with a 2-3/4" backing plate and and 3" pads for smaller areas. When I need more correction ability I use the trusty rotary when only a rotary will do. I probably use the Rupes 21 two or three times a month when I have to do a Suburban, Escalade or a big van or pickup with mostly large, flat panels. Then that's the best machine. In short, if you're a weekend enthusiast or new to the detailing business, this is a great machine to cut your teeth on and you can't really get into any trouble with it. It's the logical step up from the Porter Cable. (when I started out years ago out of the trunk of my car all I had was the original Porter Cable 7424.......not even the XP) It has plenty of power (especially with a 5" backing plate and 5-1/2" pads) and the price is very reasonable when you can't justify or afford spending more. This will do the job just fine. Plus it has a lifetime warranty. If you get to the point where volume of production becomes an issue and you need to speed things up, then you may need to consider moving to the Flex and the Rupes, but it's not really necessary until that point. Just trying to be a voice of reason as someone who has all of the machines I've mentioned and uses them all. If you have the money and want to get one of the latest and greatest, go for it. I have them and they're great machines in their own rights. But you also can't go wrong with this machine. Factor in its price point and the lifetime warranty it becomes a real bargain. And I know from experience that Griots Garage stands behind their products. I killed my first generation machine I had and they sent me the second generation machine I have now as a replacement. No questions asked. That's nice peace of mind. Nobody else will do that. Not Flex, not Porter Cable, not Rupes and not Meguiars. ConsNot as refined or smooth as a Flex or Rupes, but you can buy 2 of these and a full set of pads for less than those machines. Compared to similar machines this is a beast. far more power than a porter cable. Decent stock backing plate. The lifetime warranty is something nobody else can offer. Best polisher for the hobbyist! The GG6" simply gets the job done. It may not get heavy correction done as fast as a Rupes or a Flex, but what it lacks there it definitely makes up for in versatility. It can accept 6",5",3.5",3", and 2" backing plates meaning you can use just about any pad money can buy. Plus if your a hobbyist like the title says are you really trying to rush the polishing jobs that you do maybe a couple times a year? It is more powerful than all the other machines in its class though so it will correct faster than a PC 7424XP, G110v2, or the HF DA. It comes with a lifetime warranty from Griots as well so you don't have to worry about a thing and they actually do stand by it, just don't mess around other the machine on your own. The HD option is a good thing but I just use a an extension cord and have never had problem as long as I use the Velcro that is on the included cord to keep them together. Buy the HD. Model as having a 25 foot cord really does some in handy using this DA. I got a deal on this polisher because a customer traded it in on a flex. I planned on getting a rupes or flex but didn't do enough corrections. This was a no brainer for the price. It works so much faster and better than my OLD porter cable which is roughly 8-9 years old. I have a custom cut backing plate from Kevin Brown for 5 inch pads where the plate comes exactly to the edge. this transfers the energy and pressure to all of the pad. This polisher combined with megs mf pads and d300 is a monster.